Our Big Christmas Issue Featuring an All-Time Classic: The Rin Tin Tin Story! YO HO RINTY! 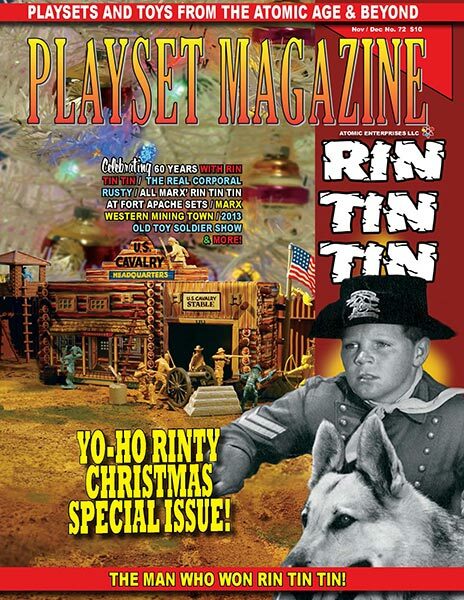 It’s the Rin Tin Tin Christmas Special issue, and it is a BIG one! Our biggest color issue yet in fact, a real collectors item filled with treasures vast and obtainable. We hope it finds you in festive spirits getting ready for the holidays. I have some long delayed plans to run The Alamo in 3-D on a TV that does the converting, and to report back to you if that was a successful experience. We’re also going to run Ben Hur as our big Christmas spectacular! I hope to be doing that around the same time that I hope you are enjoying the fruits of a lot of contributors this issue who have provided, like Indians for plastic pilgrims, a veritable feasting banquet of tasty interesting stories and the biggest of features. And just like that, the answer comes with Ron Koop’s “The Man Who Won Rin Tin Tin!” featured story, all about the guy who won, how he won, and what he took in those incredible five minutes alone on the floor of Macy’s with anything in the whole world of toys --- as long as he could wrestle it to the finish line. It’s an incredibly festive tale we know you’ll love. Then there is Kent Sprecher’s story about those elusive and mysterious “learning toys” set from schools in the early 60’s. And guess what! They contain Marx pieces that are pretty tough to come by other than in the expensive playsets – in unique coloring and at a fraction of the cost! Then, in this beautiful set’s premiere debut on our pages, there’s George Kroll’s fabulous Western Mining Town – it’s in a gorgeous overview image that certainly speaks for itself. And on top of that, The Troubled History of the Marx PX Building tells about the rarest Marx Training Center Set and no, its not the one with the POX building in it! It’s so rare this will be the first time you have seen it – and the factory documentation for it from the Marx Museum courtesy Jason and Francis Turner. Is this one you have in your closet or collection? The stories just keep growing, with a behind-the scenes look at the Rin Tin Tin television show, several pages of cool toys that came out as a result of the show, and then the big feature, the Rin Tin Tin Story. In it we document in the best detail ever, the complete story of every Rin Tin Tin playset from start to finish, with lots of descriptive color images and mint in the box contents listings, all fresh and new for your enjoyment and research. You’ll also find out what was bought and sold at the hugely entertaining Old Toy Soldier show in our reports for 2013, wrapping up some of the busiest buying time in the hobby. It’s the most festive show in the world and our coverage will put you right there as Rick Eber and Craig Remington pop the staples on a mint, fresh #4744 Marx Civil War set, and the surprises it held; for the auctions and all the playset fun to be had. We’ll introduce you to the new products too – from TSSD’s new Hand to Hand Alamo set, to the new Fort Apache, Ron Barzso's new Civil War Fort and figures and more. You'll get a front row seat to see it first, right here on these pages. Its all colorful entertainment for the mind, adding knowledge as well as experience right in your favorite reading chair. This issue is a transport truck full, no doubt about it! Wouldn’t be right if we didn’t say this issue is chock full of some of the greatest advertisers in the hobby, with offerings from all over the world of toy soldiers at hand, yours for the taking. There's a buffet of display ads, a bonanza of vintage and original Marx and other makers, and all the good new stuff you read about in the reviews. It’s all right here for Christmas in Playset Magazine's YO-HO RINTY SPECIAL CHRISTMAS issue!! We want to thank a lot of people who have come together to make this an important issue for your permanent collection. Among the many are Jim McGough, George Kroll, Ron Knoop, Mark Hegeman, Rick Eber, David Schafer, Kent Sprecher, Robert Cowgill, Marx Museum, Mike Kutnick and many others. We also thank the fabulous Jim Clouse, webmaster for this website. Thanks to you all!